Turkey, gravy, stuffing, mashed potatoes. Leftovers. Gourds and fall leaves to decorate. Family get-togethers. Shopping (ok, not until the day after – or as some stores are doing this year, the night of). These are the things that come to mind when I think of American Thanksgiving. And if I know my American side of the family well, they will have an amazing spread of food and drinks to do it up right. Thanksgiving in the United States is always celebrated on the fourth Thursday of November, regardless of the date. It became an annual tradition in 1863, during the Civil War, when President Abraham Lincoln declared a national day of thanksgiving, although there had been irregular Thanksgiving celebrations before that. It was set as a federal holiday on the fourth Thursday of November by law in 1941. 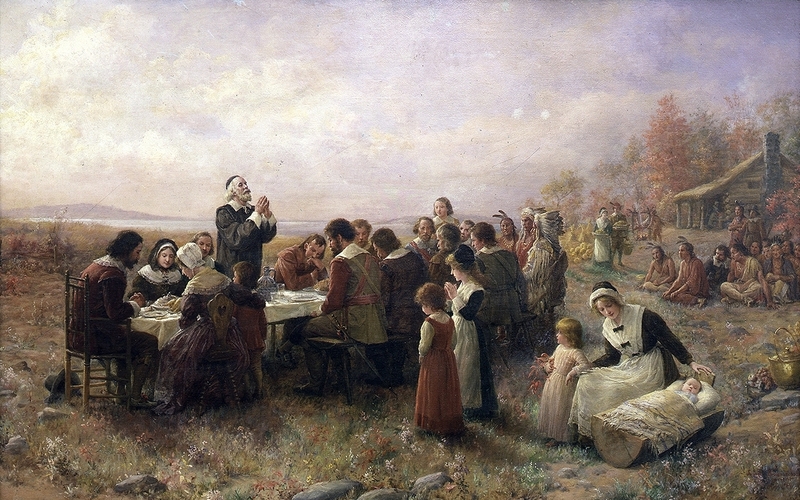 Modern traditions include: family time; big turkey dinners; often saying grace and thanking God (or whichever religion you believe) for the food on the table and the family companions; large parades; watching football (Thanksgiving Classic) or playing with family and friends in the yard (“Turkey Bowl”). Government offices and the New York Stock Exchange are closed, as well as many other companies. A hint at what holiday I’ll be talking about tomorrow, check out my video on the Toronto Star website here. If you happen to have a hard copy of the Toronto Star today, does the person on the front page of the “Canada’s Black Friday” section look familiar?